This is a beautifully designed book. There's a short book jacket ribbon across the cover. Beneath it is a gorgeous illustration embossed on both the front and back covers. The 148 pages have a yellow tinted look and a rough cut edge treatment that gives it an impression of some old tome. It's a nice idea executed well. I've not played Diablo before but that doesn't stop me from enjoying the book. I can understand from reading why the game has such a huge following. The book is written in first account by Deckard Cain, a helper character and lore-master in the game. 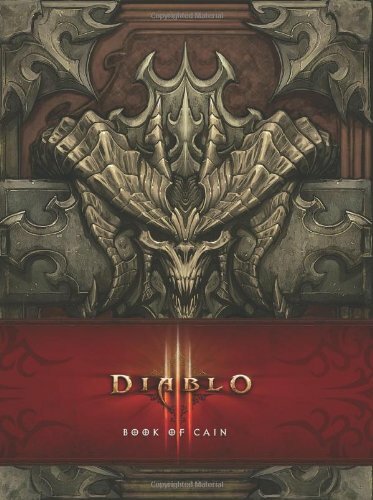 It starts right from the beginning, the creation of the universe and covers the world of Diablo, its history, the significant events and the characters. For fans, it's going to provide a deeper understanding, and a recap on what has happen. For non-players like me, it's still an intriguing read. It's good fantasy writing. The illustrations featured are beautiful and detailed sketches of characters, creatures and a few locations. There's usually one piece of art for every two pages. They remind me of pencil sketches for comic panels just before the inking. The art is great with really good hatching. I'm not sure who drew them but the credits at the back mention the art direction from Glenn Rane, Doug Gregory and Jeremy Cranford, with additional art from Trent Kaniuga and John Polidora. Also included right on the back cover inside a sealed envelope is the map of Diablo. It's a wonderfully crafted book. Highly recommended to all fans of Diablo, and to those who love to read fantasy. Like the reviewer says, its a must for "DIE HARD" dialblo fans, ultimately its a novel, more to graphic kinda novel. Definitely not an art book, so fans of art books , this is not your type. I think if u can get the CE edition , thats an art book, but, getting it is another matter all together. The drawings You mention in description [um, some of them] I am sure, was done by Jean Baptiste Monge. I like his character designs very much and He is very good in pencil and painting work.